News this morning from the USA is that the Ringling Brothers, Barnum and Bailey circus is to close: CNN, NPR. Chicago Tribune. 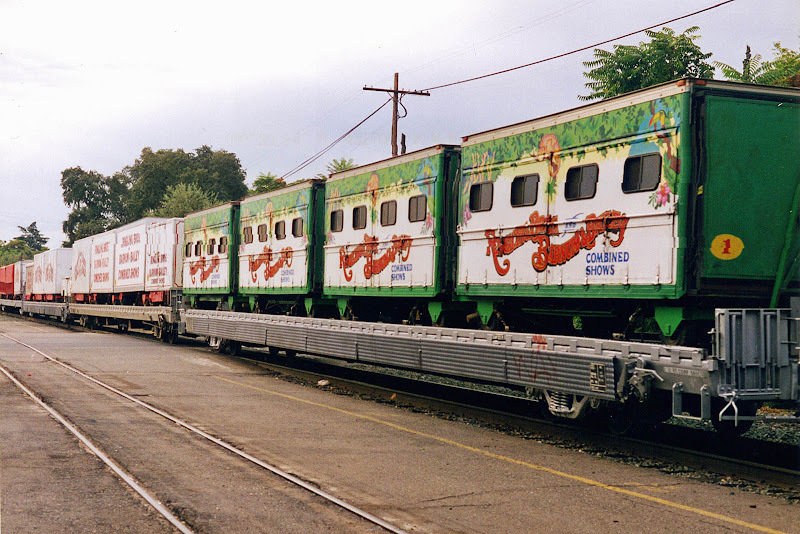 This will mean the closure of the unique circus train operations, which were run as two trains, the 'blue' and the 'red'. The entire circus has been moved by train across the USA and Canada, with recent forays into Mexico, and will continue this way until closure in May 2017. 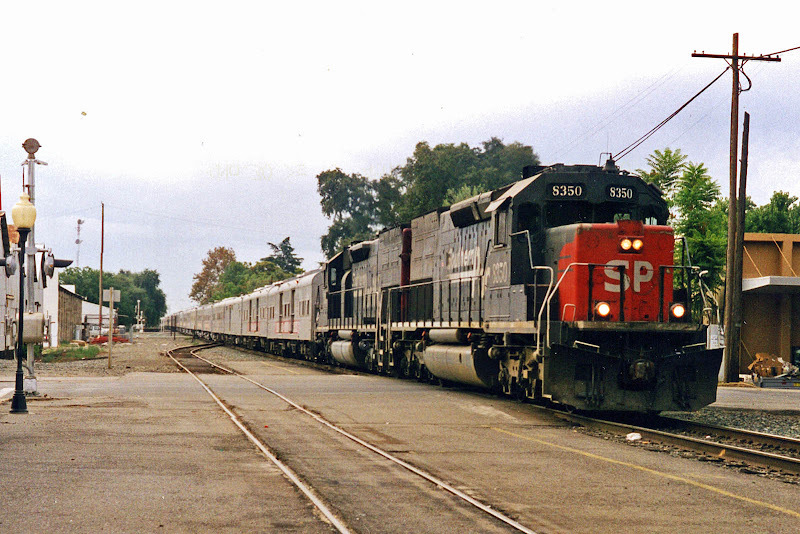 I was once lucky enough to see the 'red' train, and by chance, while in Chico, California, on 8th September 1997. Chico depot seems to have been improved for passengers, but has lost its sidings in the past 20 years. The immense length of the train, at about 40 coaches and 20 further flats, may start to be appreciated here. It was heading northbound over what was originally the California and Oregon Railroad Company opened here in 1870. 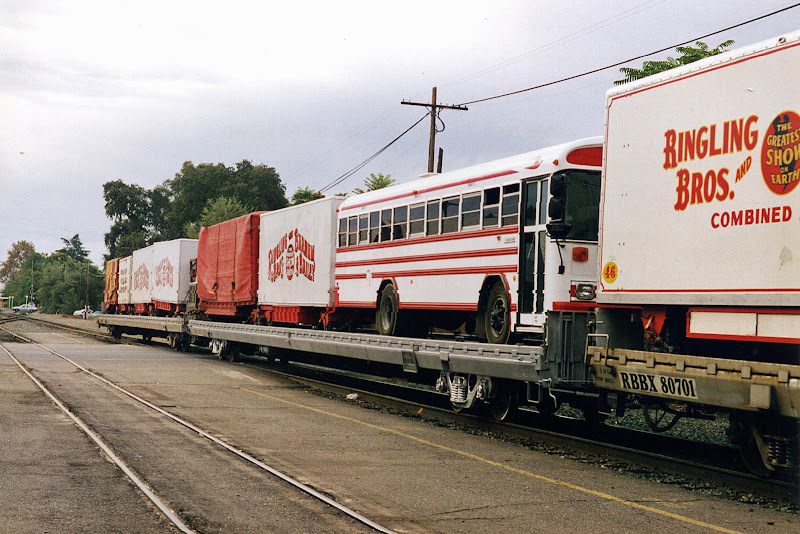 The Southern Pacific brand was in control by 1887, and lasted until taken over by Union Pacific in 1996. The line is now part of the "I-5 corridor" after the parallel interstate highway, and the line is the Valley Subdivision (East Roseville - Dunsmuir). Rio Grande style 'Speed Lettering is applied to these SD40T-2 "tunnel motor" locomotives, showing that they have been repainted since 1991. Lead locomotive 8350 (EMD Serial No 73685-1) was built in June 1974. Retired by UP on 27th August 2002. After SP/UP service it appears to have been sold to Helm Leasing (HLCX 6130), and after service with them it ended its days in Brazil in 2008. 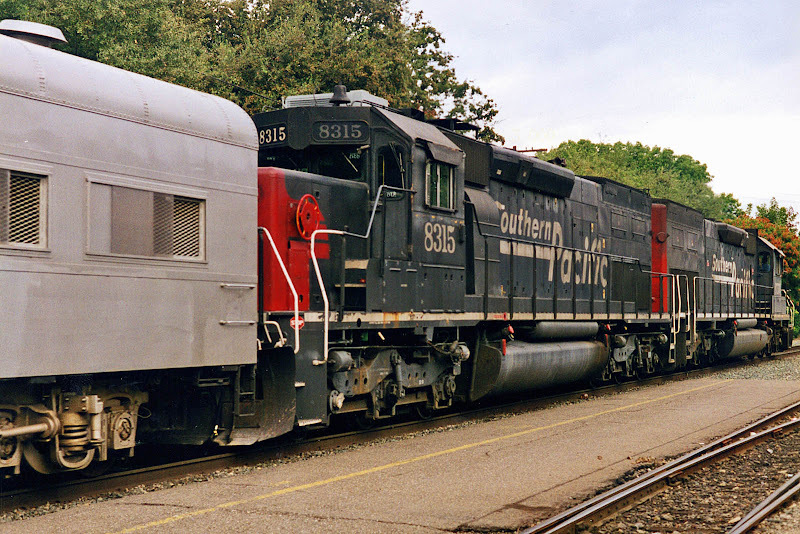 SP8315 (EMD Serial No 776069-9) was new in March 1978. Retired 17th January 2001, and disposed by UP to National Railway Equipment (NREX 8315). Also exported to Brazil in 2008. The lead cars are for animals, this part of the train said to have the best ride, RBBX 60004 was originally UP 6300 an aluminium bodied vehicle built by AC&F in 1961 as a Baggage / Storage car, sold to Ringling in 1972, becoming surplus in the wake of the foundation of Amtrak. To Florida Railroad Museum, Parrish, Florida, in 2012. Flat cars supporting the ancillary functions of a circus. RBBX 80701, an 89 foot flat,was built by AC&F in 1967 as GTW 303109. 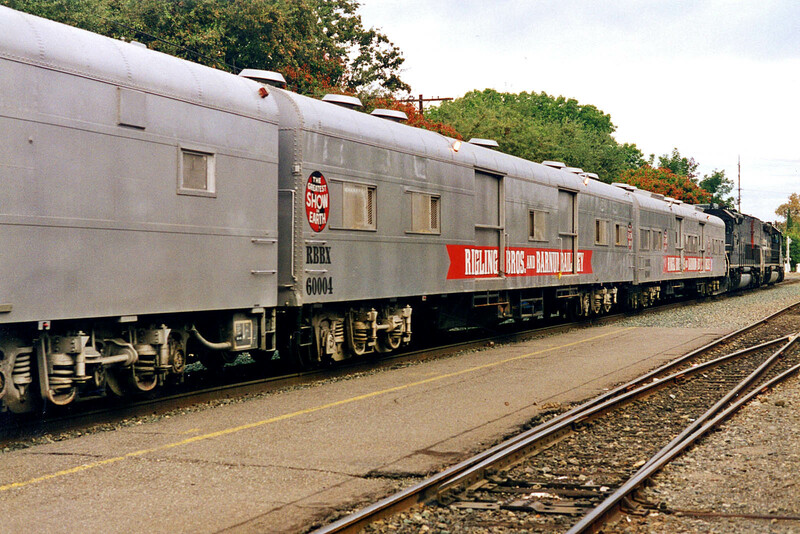 The Red Unit Ringling Bros. and Barnum & Bailey Circus TRAIN is Coming to Town!